It was not just primal passion but the tempestuousness and timing that caught the eye and ear. The Waifs were reaching the climax of their grand maternal eulogy Bridal Train when a slender blonde thrust her tongue into the gaping mouth of her precocious female pal. It was way back in the bleachers, on the left aisle, and under the stony gaze of a mute male statue guarding the long vacated bar. And, of course, in clear view of bemused spectators in a near capacity crowd soaking up the merriment of a group celebrating 15 years of musical magic. The Waifs are not just masters & mistresses of cross genre fans but also same gender persuasion. Vikki Thorn, nee Simpson's tale of grandma eloping on a slow post World War 11 train from Perth to Sydney to sail to California to her American sailor husband may have been saved for song #11. But it struck a chord with the vast audience who sang along and the passionate pair of land-locked lips for 4 minutes 21 seconds of aural or oral bliss. It's a credit the much loved group, swollen to a sextet on this tour, provided so much musical solace to sweet young thangs and older pals who haven't found the right man yet. 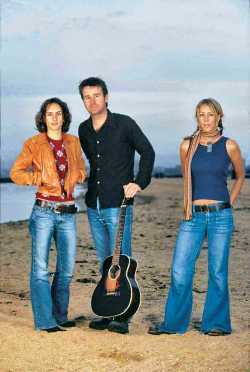 The Waifs are not your stereotypical country-folk-rock combo - they again proved as entertaining live as on CD and DVD. They opened with fifth album entrée song Pony and galloped through a 21-song set to encore finale London Still with timely tempo changes. Salient sequencing enabled the band to punctuate new album favourites such as Josh Cunningham's evocative Eternity and his rollicking How Many Miles with Thorn's title track Sundirtwater and older songs - Donna Simpson's videogenic Highway One and Josh's Lighthouse. The sisters' patter, unlike some peers, never seems contrived - not even newly wed Donna's intro to a song for an ex-boyfriend - Love Let Me Down - or Take It In. The latter was preceded by a nod to Victorian violinist Jen Anderson to illustrate a return to the scene of the rhyme - Cable Beach, Broome - where The Waifs journey began when the sisters met their co-founder Cunningham. Equally charming was their self-deprecatory comparison to The Seekers during skiffle driven revamp of English born yodelling ARIA Hall of Fame inductee Frank Ifield's I Remember You. The trio dismissed the band and performed it an acoustic mode, replete with ukulele and harmonica, in the vein of their recent touring companion Keith Urban and Dixie Chicks. It was a fitting tribute to the 1962 smash hit by twice wed Ifield, born in Coventry, England on November 30, 1937, but transported here by his Australian born parents in 1946. By then it was nostalgia time for Bridal Train singalong, Lighthouse and new songs Lies, Stay and Goodbye. The sisters' autobiographical Fisherman's Daughter enabled Thorn to do an a capella gospel tribute to the sisters' grandfather, then another rollicking train song and slice of the Sierra Nevada with an acoustic rendition of Cunningham's new disc finale Feeling Sentimental. Like most Waifs concerts they finished on a high with the uplifting London Still - by then the Bridal Train cameo combatants were out of breath. Also buried deep in the nocturnal memory bank was support act Abby Dobson whose voice suffered a muffled mix akin to an abandoned bride. It was not the fate shared by The Waifs when they opened for expatriate Australasian country superstar Keith Urban at the Yarra bank tennis courts earlier in the year. The night may still have been young by dance droogs' body clocks. But we headed for the street named after Lincolnshire doctor's son Matthew Flinders who first landed on the eastern shores of Van Diemens Land in 1791 before finding another island or two further north on his sea travels after learning the trade as a roadie to the infamous, mutinous Captain William Bligh.